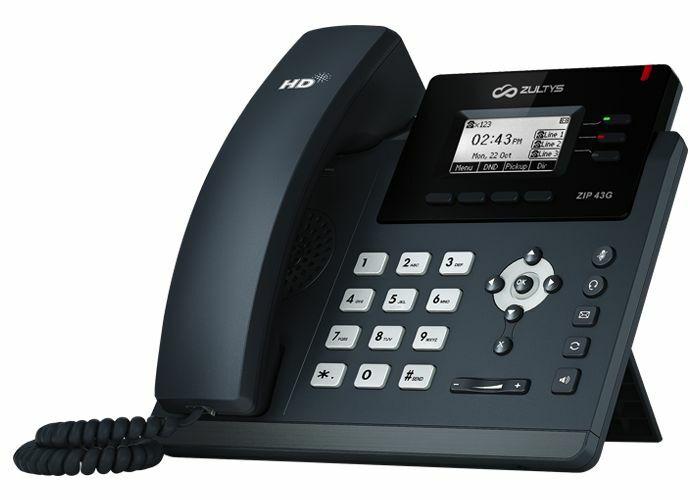 The ZIP 43G is an easy to use, cost effective, business IP phone with a backlit graphical display, 3 programmable soft keys and dual Gigabit Ethernet ports with Power over Ethernet (PoE). A dedicated headset port and Electronic Hook Switch (EHS) support offer enhanced usability for wired and wireless headset users. The ZIP 43G is fully compatible with Zultys’ ZAC and MXIE Unified Communication applications, allowing users to manage calls and messages directly from their computer. Like all Zultys phones, the ZIP 43G utilizes the Session Initiation Protocol (SIP) open standard and is managed from the Zultys MX Administrator application for rapid deployment and the industry’s lowest total cost of ownership. The ZIP 43G phone has been designed with ease of use as a priority. Dedicated and context sensitive soft keys for commonly used functions such as Voicemail, Conference, Hold, Mute, Transfer, Redial, Do Not Disturb, Park/Pickup, one-touch call recording and more ensure the user is able to concentrate on the call at hand rather than how to drive the phone. Three programmable soft keys are available for Line Appearances, Busy Lamp Field (BLF), Speed Dial, Park Slot Monitoring and more. Full-duplex speakerphone with acoustic echo cancellation, combined with high quality wideband HD speaker, microphone and handset components ensure conversations are always loud and clear to minimize fatigue for heavy phone users. Staff requiring mobility around the office will appreciate the convenience of the Electronic Hook Switch control when the ZIP 43G is combined with a compatible Wireless Headset and the Zultys EHS 3xi adapter. From initial deployment and configuration to future enhancements and upgrades, the Zultys ZIP 43G is designed to save your business time and money. Dual auto-sensing switched Gigabit Ethernet ports eliminate additional wiring and simplify installation. Integrated IEEE 802.3af Power-over-Ethernet and low power consumption ensure rapid deployment while minimizing your carbon footprint. Full support for industry standard VLAN and QOS networking protocols ensure voice is always treated with the highest priority across your network. Simple centralized provisioning is provided via the Zultys MX Administrator graphical management interface providing a single point of management for the complete Zultys ‘All-in-One’ unified communications solution.